...and makes it possible for the robot to know exactly what to pick, and how to pick it up. An Anybus X-gateway handles the conversion between the robot cabinet’s DeviceNet system and the end customer’s PROFIBUS network. SVIA in Sweden use Anybus X-gateways to connect their DeviceNet-based robot cells to any network that their customers are using. 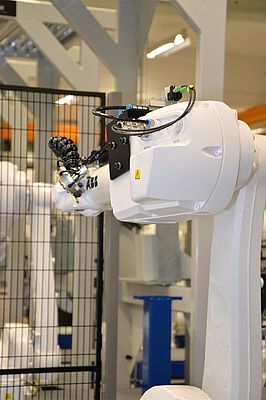 Svensk Industriautomation (SVIA) is a fast-growing automation company in Jönköping, Sweden, developing robot systems for customers in the Nordic countries, Germany, U.K., the Netherlands, and the U.S. 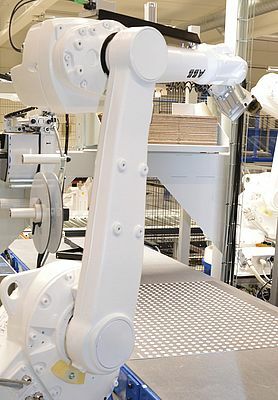 The systems are put together to robot cells which are able to communicate with other systems in a factory for example. 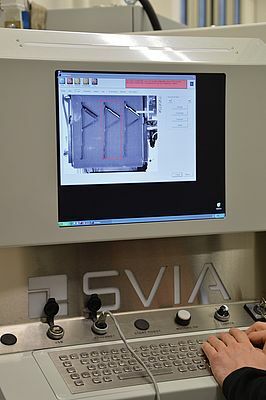 The core of the robot cell is SVIA's own vision system called Pickvision, which detects exactly how a particular object is placed on a conveyor belt and thereby enables a robot to pick up the object. In simple terms, you could say that SVIA enables robots to see. This revolutionary technology has become very popular on the automation market and has enabled SVIA to double its turnover during the past few years. "Our strength lies in the simplicity," says Anders Mandorsson, Designer and Project Manager at SVIA. "It is very easy to tell the robot what to pick from the carrier belt, and then you are ready to go." 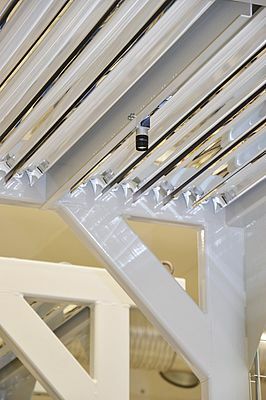 By using the Pickvision software, users take a picture of the object which is to be picked from the belt. The software automatically detects the shape of the object and every time this shape shows up in the camera, the robot is able to determine how to pick it up. As most advanced automation systems, SVIA's robot cells need to communicate with some kind of plant-wide industrial network and this type of communication is not always hassle-free. "A couple of years ago, we built a robot cell for a customer who promised me access to their PROFIBUS system, but after a while, it became clear that our system was only to be a separate node in their network. That's when we found Anybus X-gateways from HMS. We tried installing one into our cabinet and it handled the conversion between our DeviceNet based system and the customer's PROFIBUS system in a very elegant way," says Anders Mandorsson. Since then, SVIA has used Anybus X-gateways in many of the robot cells they deliver to customers around the world. Once again, simplicity is key. "DeviceNet is the standard we use in most of our cabinets and instead of handling the conversion to other networks ourselves, we simply install an X-gateway from HMS. It is cheaper, but above all, it makes it easier for the customer since he gets a clear segregation between our system and his own factory network," says Anders Mandorsson. SVIA's robot cells usually come with robots from ABB which operate on a DeviceNet based network. The robots can easily communicate with another DeviceNet network, but if they are to be connected to another network, for example a PROFIBUS network (with a PLC from Siemens) or an EtherCAT network (with a PLC from Beckhoff) a "translator" is needed. Anybus X-gateways handle the conversion between the two networks through built-in software which restructures the telegrams from one side and make them understandable on the other side. The configuration is made in a matter of minutes by using the Anybus Configuration Manager software which means that no programming is necessary. SVIA's robot cells are very flexible and can easily be adjusted to cater for different customer applications such as mounting, packaging, drilling and lathing. Through Anybus X-gateways, SVIA can also be very flexible when it comes to the network they can connect to. "To be honest, we don't really think much about networking anymore," says Anders Mandorsson. "When we create a robot system, we simply order the X-gateway which converts to the customer's industrial network - we plug it in and it works."